It might be just me, but it seems as though people don’t look as old as they used to. By that I mean, when you look at images of a man or woman who is, lets say 50 in 1970, they look much older than the average 50 year old today. Like I said it might just be me reflecting on our youth obsessed society. I think that is why I am so attracted to this series of images from photographer Tom Hussey. 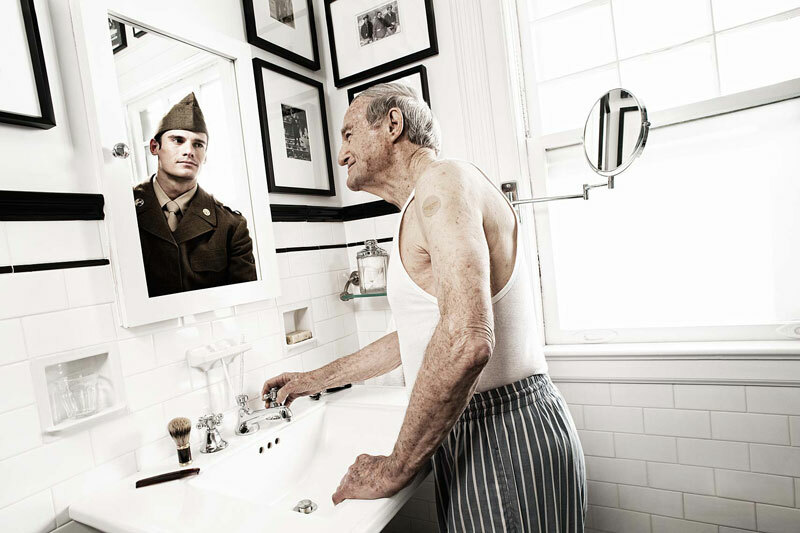 Reflections is a series of images that Hussey began when he created an image of an 80 year old World War II veteran that said he still felt and thought like he did in his youth. I can see that, I don’t feel or think like a guy my age, or at least what a guy my age is supposed to according to societal norms. The complete series tells the story of youth reflected from the images of the elderly as they gaze into the mirror of themselves. Posted in Design and Art, photography and tagged Age, Illustration, Introspection, Photo, photography, Reflections, Society, Tom Hussey, Youth on September 9, 2013 by Author. ← The Monocle Guide to Better Living.